This example shows how to model a radar's hardware, signal processing, and propagation environment for a driving scenario. First you develop a model of the radar transmit and receive hardware, signal processing, detection, and estimation using Phased Array System Toolbox™. Then you model the vehicle motion and track the synthetic vehicle detections using Automated Driving Toolbox™. In this example, you use this radar model to track detections in a highway driving scenario. This example requires Phased Array System Toolbox. You can model vehicle motion by using the drivingScenario object from Automated Driving Toolbox. The vehicle ground truth can then be used to generate synthetic sensor detections, which you can track by using the multiObjectTracker object. For an example of this workflow, see Sensor Fusion Using Synthetic Radar and Vision Data. The automotive radar used in this example uses a statistical model that is parameterized according to high-level radar specifications. The generic radar architecture modeled in this example does not include specific antenna configurations, waveforms, or unique channel propagation characteristics. When designing an automotive radar, or when a radar's specific architecture is known, using a radar model that includes this additional information is recommended. Phased Array System Toolbox enables you to evaluate different radar architectures. You can explore different transmit and receive array configurations, waveforms, and signal processing chains. You can also evaluate your designs against different channel models to assess their robustness to different environmental conditions. This modeling helps you to identify the specific design that best fits your application requirements. In this example, you learn how to define a radar model from a set of system requirements for a long-range radar. You then simulate a driving scenario to generate detections from your radar model. A tracker is used to process these detections to generate precise estimates of the position and velocity of the vehicles detected by your automotive radar. The radar parameters are defined for the frequency-modulated continuous wave (FMCW) waveform, as described in the example Automotive Adaptive Cruise Control Using FMCW Technology (Phased Array System Toolbox). The radar operates at a center frequency of 77 GHz. This frequency is commonly used by automotive radars. For long-range operation, the radar must detect vehicles at a maximum range of 100 meters in front of the ego vehicle. The radar is required to resolve objects in range that are at least 1 meter apart. Because this is a forward-facing radar application, the radar also needs to handle targets with large closing speeds, as high as 230 km/hr. The radar is designed to use an FMCW waveform. These waveforms are common in automotive applications because they enable range and Doppler estimation through computationally efficient FFT operations. The radar uses a uniform linear array (ULA) to transmit and receive the radar waveforms. Using a linear array enables the radar to estimate the azimuthal direction of the reflected energy received from the target vehicles. The long-range radar needs to detect targets across a coverage area that spans 15 degrees in front of the ego vehicle. A 6-element receive array satisfies this requirement by providing a 16 degree half-power beamwidth. On transmit, the radar uses only a single array element, enabling it to cover a larger area than on receive. Estimate the direction-of-arrival of the received signals using a root MUSIC estimator. A beamscan is also used for illustrative purposes to help spatially visualize the distribution of the received signal energy. Model the radar transmitter for a single transmit channel, and model a receiver preamplifier for each receive channel, using the parameters defined in the example Automotive Adaptive Cruise Control Using FMCW Technology (Phased Array System Toolbox). The radar collects multiple sweeps of the waveform on each of the linear phased array antenna elements. These collected sweeps form a data cube, which is defined in Radar Data Cube (Phased Array System Toolbox). These sweeps are coherently processed along the fast- and slow-time dimensions of the data cube to estimate the range and Doppler of the vehicles. Use the phased.RangeDopplerResponse object to perform the range and Doppler processing on the radar data cubes. Use a Hanning window to suppress the large sidelobes produced by the vehicles when they are close to the radar. Identify detections in the processed range and Doppler data by using a constant false alarm rate (CFAR) detector. CFAR detectors estimate the background noise level of the received radar data. Detections are found at locations where the signal power exceeds the estimated noise floor by a certain threshold. Low threshold values result in a higher number of reported false detections due to environmental noise. Increasing the threshold produces fewer false detections, but also reduces the probability of detection of an actual target in the scenario. For more information on CFAR detection, see the example Constant False Alarm Rate (CFAR) Detection (Phased Array System Toolbox). The phased.RangeEstimator and phased.DopplerEstimator objects convert the locations of the detections found in the range-Doppler data into measurements and their corresponding measurement variances. These estimators fit quadratic curves to the range-Doppler data to estimate the peak location of each detection. The resulting measurement resolutions are a fraction of the range and Doppler sampling of the data. The root-mean-square (RMS) range resolution of the transmitted waveform is needed to compute the variance of the range measurements. The Rayleigh range resolution for the long-range radar was defined previously as 1 meter. The Rayleigh resolution is the minimum separation at which two unique targets can be resolved. This value defines the distance between range resolution cells for the radar. However, the variance of the target within a resolution cell is determined by the waveform's RMS resolution. For an LFM chirp waveform, the relationship between the Rayleigh resolution and the RMS resolution is given by . where σRMS is the RMS range resolution and ΔRayleigh is the Rayleigh range resolution. The variance of the Doppler measurements depends on the number of sweeps processed. Now, create the range and Doppler estimation objects using the parameters previously defined. To further improve the precision of the estimated vehicle locations, pass the radar's detections to a tracker. Configure the track to use an extended Kalman filter (EKF), which converts the spherical radar measurements into the ego vehicle's Cartesian coordinate frame. Also configure the tracker to use constant velocity dynamics for the detected vehicles. By comparing vehicle detections over multiple measurement time intervals, the tracker further improves the accuracy of the vehicle positions and provides vehicle velocity estimates. Use the free space channel to model the propagation of the transmitted and received radar signals. In a free space model, the radar energy propagates along a direct line-of-sight between the radar and the target vehicles, as shown in the following illustration. Create a highway driving scenario with three vehicles traveling in the vicinity of the ego vehicle. The vehicles are modeled as point targets, and have different velocities and positions defined in the driving scenario. The ego vehicle is moving with a velocity of 80 km/hr and the other three cars are moving at 110 km/hr, 100 km/hr, and 130 km/hr respectively. 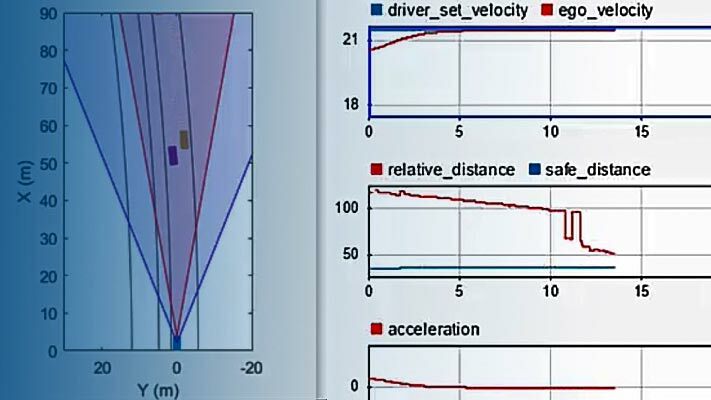 For details on modeling a driving scenario, see the example Create Actor and Vehicle Trajectories. The radar sensor is mounted on the front of the ego vehicle. To create the driving scenario, use the helperAutoDrivingRadarSigProc function. To examine the contents of this function, use the edit('helperAutoDrivingRadarSigProc') command. The following loop uses the drivingScenario object to advance the vehicles in the scenario. At every simulation time step, a radar data cube is assembled by collecting 192 sweeps of the radar waveform. The assembled data cube is then processed in range and Doppler. The range and Doppler processed data is then beamformed, and CFAR detection is performed on the beamformed data. Range, radial speed, and direction of arrival measurements are estimated for the CFAR detections. These detections are then assembled into objectDetection objects, which are then processed by the multiObjectTracker object. The previous figure shows the radar detections and tracks for the 3 target vehicles at 1.1 seconds of simulation time. The plot on the upper-left side shows the chase camera view of the driving scenario from the perspective of the ego vehicle (shown in blue). For reference, the ego vehicle is traveling at 80 km/hr and the other three cars are traveling at 110 km/hr (orange car), 100 km/hr (yellow car), and 130 km/hr (purple car). The right side of the figure shows the bird's-eye plot, which presents a "top down" perspective of the scenario. All of the vehicles, detections, and tracks are shown in the ego vehicle's coordinate reference frame. The estimated signal-to-noise ratio (SNR) for each radar measurement is printed next to each detection. The vehicle location estimated by the tracker is shown in the plot using black squares with text next to them indicating each track's ID. The tracker's estimated velocity for each vehicle is shown as a black line pointing in the direction of the vehicle's velocity. The length of the line corresponds to the estimated speed, with longer lines denoting vehicles with higher speeds relative to the ego vehicle. The purple car's track (ID2) has the longest line while the yellow car's track (ID1) has the shortest line. The tracked speeds are consistent with the modeled vehicle speeds previously listed. The two plots on the lower-left side show the radar images generated by the signal processing. The upper plot shows how the received radar echos from the target vehicles are distributed in range and radial speed. Here, all three vehicles are observed. The measured radial speeds correspond to the velocities estimated by the tracker, as shown in the bird's-eye plot. The lower plot shows how the received target echos are spatially distributed in range and angle. Again, all three targets are present, and their locations match what is shown in the bird's-eye plot. Due to its close proximity to the radar, the orange car can still be detected despite the large beamforming losses due to its position well outside of the beam's 3 dB beamwidth. These detections have generated a track (ID3) for the orange car. The previous driving scenario simulation used free space propagation. This is a simple model that models only direct line-of-sight propagation between the radar and each of the targets. In reality, the radar signal propagation is much more complex, involving reflections from multiple obstacles before reaching each target and returning back to the radar. This phenomenon is known as multipath propagation. The following illustration shows one such case of multipath propagation, where the signal impinging the target is coming from two directions: line-of-sight and a single bounce from the road surface. The overall effect of multipath propagation is that the received radar echoes can interfere constructively and destructively. This constructive and destructive interference results from path length differences between the various signal propagation paths. As the distance between the radar and the vehicles changes, these path length differences also change. When the differences between these paths result in echos received by the radar that are almost 180 degrees out of phase, the echos destructively combine, and the radar makes no detection for that range. Replace the free space channel model with a two-ray channel model to demonstrate the propagation environment shown in the previous illustration. Reuse the remaining parameters in the driving scenario and radar model, and run the simulation again. % path and a different channel is used for the receive path. The previous figure shows the chase plot, bird's-eye plot, and radar images at 1.1 seconds of simulation time, just as was shown for the free space channel propagation scenario. Comparing these two figures, observe that for the two-ray channel, no detection is present for the purple car at this simulation time. This detection loss is because the path length differences for this car are destructively interfering at this range, resulting in a total loss of detection. Plot the SNR estimates generated from the CFAR processing against the purple car's range estimates from the free space and two-ray channel simulations. As the car approaches a range of 72 meters from the radar, a large loss in the estimated SNR from the two-ray channel is observed with respect to the free space channel. It is near this range that the multipath interference combines destructively, resulting in a loss in signal detections. However, observe that the tracker is able to coast the track during these times of signal loss and provide a predicted position and velocity for the purple car. This example demonstrated how to model an automotive radar's hardware and signal processing using Phased Array System Toolbox. You also learned how to integrate this radar model with the Automated Driving Toolbox driving scenario simulation. First you generated synthetic radar detections. Then you processed these detections further by using a tracker to generate precise position and velocity estimates in the ego vehicle's coordinate frame. Finally, you learned how to simulate multipath propagation effects by using the phased.TwoRayChannel model provided in Phased Array System Toolbox. The presented workflow enables you to understand how your radar architecture design decisions impact higher-level system requirements. Using this workflow enables you to select a radar design that satisfies your unique application requirements. Richards, Mark. Fundamentals of Radar Signal Processing. New York: McGraw Hill, 2005.